The traditional 18 hole format on a challenging course can take between three and a half and five hours. Add in the travel time, plus the “social” time and you can be looking at between six to seven hours for your “golfing experience”. For most traditional golfers who are retired and “time-rich”, spending this amount of time away from home is both enjoyable and rewarding. However, in today’s society there is a growing number of people who are “time-poor” and cannot afford to dedicate this amount of time to golf. This is why people are starting to get involved in less time-consuming hobbies that meet their hectic lifestyles. In a recent survey 34% of golfers said that work commitments stopped them playing more, with 29% citing family commitments as another main reason. Many of the recent initiatives to increase participation are well-intentioned – but they fail to get to the heart of the problem. Fundamentally, golf has lost touch with modern consumer lifestyles. People want enjoyable, timely and rewarding “leisure experiences” that enrich their lives and offer excellent value. The time required to enjoy the “golfing experience” is too long for most potential customers. Golf needs to develop a range of “customer packages” that allow people to include golf in their life, on their terms. To do this the golf industry needs to immerse itself in peoples routines, priorities and weekly existence. This deep and detailed insight will prove priceless when developing consumer-led growth strategies. Golf isn’t time-consuming – it’s just not got enough time-relevant options for customers to enjoy. 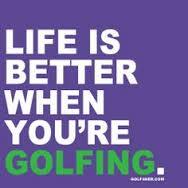 Golf would not be perceived as time-consuming if you could start enjoying it in 30 minute sessions. If you then gave customers the option to “add-on” additional sessions to suit their lifestyle, then you have created a flexible system that could result in more people considering golf as a leisure activity for them.